Design – This year for our lift we gained a special chain lift. 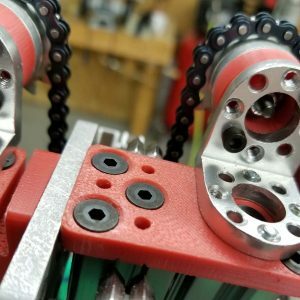 Each section rises up with the chain and special rollers. 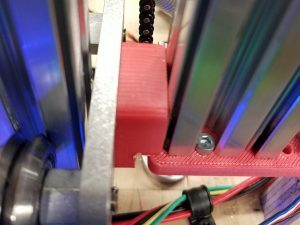 It gets support from special red 3D printed parts. The lift is quite sturdy being made of iron. And made well enough to be quite steady. Working with the grabber – The lift and grabber have to work together in unison to be able to lift the glyphs and place them in the crypto-box. 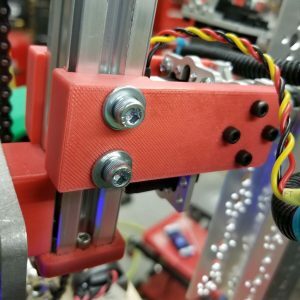 The Grabber and Lift are connected by simply a piece of metal and 2 3D printed parts. Final Words – In final words, our lift is a strong, sturdy, and a well-made piece of mechanics that will get its job done when needed.